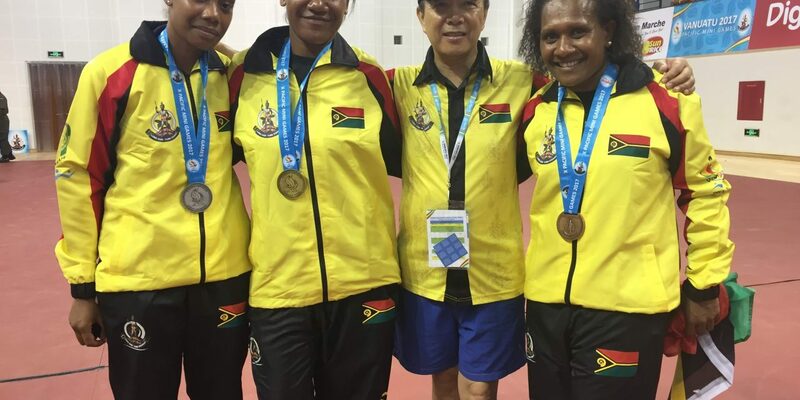 Vanuatu’s queen of table tennis, Anolyn Lulu, ensured her country claimed all three medals in the Vanuatu 2017 women’s singles on Saturday night, winning an epic bronze medal match against New Caledonian’s Lorie La 4-3 in front of an ecstatic home crowd. 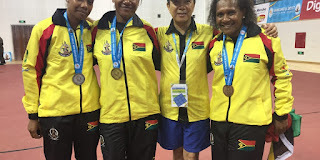 The gold medal match was an all-Vanuatu affair, guaranteeing gold and silver for the host nation, and was won by Priscilla Tommy 4-0over Stephanie Kwea,leaving it to Lulu to secure bronze. Fourteen-year-old La showed composure beyond her years to win the first two games, stunning the crowd at Korman indoor stadium. But 38-year-old Lulu won a tight third game to force her way back into the contest, willed on by the home crowd.A thrilling fourth game saw La take a 10-5 lead before Lulu fought back, scoring 7 unanswered points to take the game 12-10. Lulu dominated the fifth game, while La responded in the sixth, leaving the crowd on tenterhooks in the seventh and final game. Lulu built a 6-1 lead before conceding several points, but managed to hang on for an 11-6 victory and a bronze medal. Lulu said her incredible fightback was inspired by the desperation to make sure Vanuatu won every medal. “I had to fight,” a tearful Lulu told the Vanuatu 2017 Games News Service. “I had to fight to make Vanuatu won gold, silver and bronze….and now I know why I didn’t make it to the final (gold medal match) because I had to fight for third place for Vanuatu. Priscilla Tommy capped a remarkable return from a seven-year absence from the sport by winning gold, leaving Kwea to settle for silver.